We won't bother you by saying how much hectic things have been over here - just this little note. Now to the things that have been happening! This is the final alpha update, because afterwards we're going beta! (Early Access, Game in Development, Preview title... you name it). We're hoping for Tuesday, but could be Wednesday too. Below are some of the new things. More details in next week's changelog on Steam. That's the most important aspect of the next update. 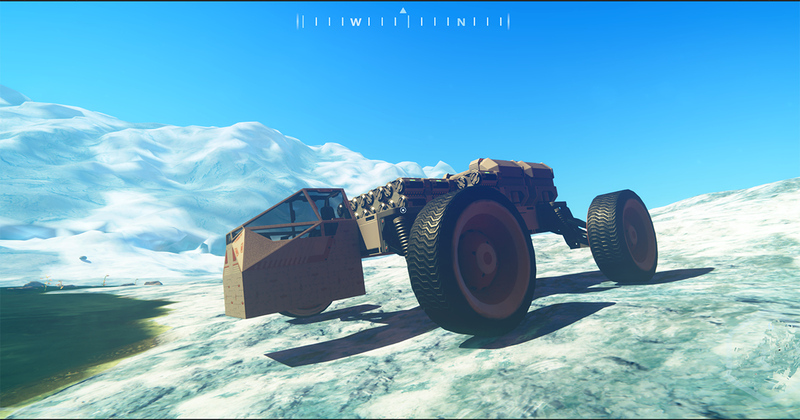 Pavel has reworked the suspensions to work with the new building system. There's still a bug when you deconstruct vehicles - specifically when you separate the two grids (wheel from the vehicle). It's either getting fixed or you don't mess with that. Yes, we've heard your loud complaints. We hated getting lost ourselves. We did something about it. Let us tell you that it's absolutely incredible knowing how to get home. The possibilities that opened and the widening of the action radius is truly game-breaking (in the best possible way). Caves are now part of the game. We had to rewrite the way world objects are generated to be able to spawn them inside caves (which fixed levitating objects too). The caves and cave-like formations may be weird sometimes, but always a great sight. Optimizations Are Part of the Update Too. One of the them is the fact that game objects (e.g. trees and rocks) were previously initialized in all their voxel states. So after a 2-minute jetpack flight, you got some nice 433,731 objects in a scene. They would eat half a gig of your RAM. Thanks to Tomas' rework, there are now only 32,085 game objects in the same fly-by. They eat 90 MB of RAM. All this is an under-the-hood change with no effect on gameplay or visuals. Among other things we did to make the game run smoother are: less colliders on water bodies, different work with textures, and last but not least - more rich graphic options for the game, such as water reflections, motion blur or terrain and object visibility distance. So you can turn off exactly the performance killers that are most affecting your machine. As was said earlier, more details in the changelog. We are experimenting with planet sizes. Next week's udpate will feature a planet that's only 32 kms in diameter (half the size of the original one). We believe this will make the gameplay more interesting - being able to travel through different biomes faster. This is not part of the optimization initiative, but a purely gameplay thing - we might be wrong with our assumptions, but that's on you Nomads to let us know how the game feels with smaller biomes. It's a starting point for planets with varying sizes too. After yesterday's brief unnerving experience where the Planet Nomads' Steam page ceased to exist, things are back to normal. Who would have thought that switching the game to Early Access would be such an adventure (tip to fellow devs: Enable Early Access right away). We've also pushed the survival update to the main branch and asked Valve for another review (it was rejected before, because Survival was not part of the previous alpha build). We should be up and ready in a couple days and then there's nothing standing in our way to Early Access release on 18th April. So that's about that. We hope you're going to love the new update and thanks for all the feedback on our forum.